Rackspace is home to hundreds of thousands of customers, including over 40% of the Fortune 100 companies, making it one of the most popular hosting providers on the internet. With clients like NASA and CERN, opting for Rackspace is opting for the big leagues. That being said, navigating the company’s website could be a bit of a challenge given all of the services that Rackspace provides. This may be discouraging to inexperienced users or could be quite attractive to those looking for a one-stop shop for all of their advanced hosting needs. The skill level required to work on Rackspace seems to range from intermediate to advanced knowledge of webhosting and configuration. Although Rackspace offers reliable support, knowing what you want out of a hosting platform seems to be imperative before seeking aid. This is because Rackspace focuses more on the power behind websites than the actual websites themselves. So, the typical client would be one with a website already built and looking for a host to place it on; this integration requires a certain level of expertise and know-how. Oracle Database – one of the most secure databases in use today, secures data stored on Rackspace’s servers. Disk space is allocated based on the respective needs of clients and can range anywhere from 2 gigabytes all the way up to multiple terabytes. Webmaster can also register as many domain names as desired. Furthermore, Rackspace offers full ecommerce support, with extra features that can, for example, help a store calculate downtime losses, its availability, ensure security and even make it scalable. Rackspace is at the fore of cloud computing. The company worked with NASA to develop OpenStack, an open-source, scalable cloud operating system that makes it easy to move data from one data center or service provider to another. The system also supports open source software. OpenStack has now become the fastest-growing cloud platform on earth, with over 12,000 contributors in 130 countries. It might be cool to know that all this technology is now available to you, the client. Rackspace’s customer support is provided by certified engineers, meaning your issues will be handled by someone with years worth of training as opposed to a few weeks of skill building workshops. Database Administrators, Red Hat Certified Engineers and Microsoft Certified Professionals work on helping with architecting, managing or troubleshooting environments. Rackspace offers 24/7 support via ticket, phone, email or live chat from Fanatical Support. 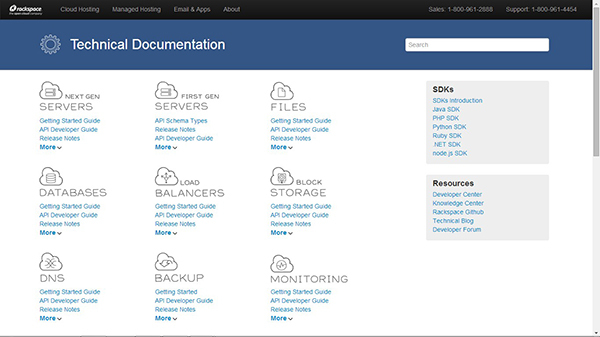 Apart from that, there are various documents and web pages that help clients navigate the complex hosting environment. Rackspace’s knowledgebase is well organized and detail oriented; if you take time to go through it, not only could you possibly find the answers to your inquiries, you might acquire a wealth of knowledge that you can channel back into your website strategies. Are you a visual learner? Sadly, perhaps the biggest flaw against Rackspace is its steep pricing, which seems geared towards business clients. To help solve this, Rackspace does offer a pricing structure that allows for the adding and deducting of various options like security and backup and the amount of cloud usage, storage space and bandwidth. Basic plans start at $150 per month with $10 for domain name registration. This comes with unlimited domains, 50 GB storage, 500 GB bandwidth and Linux/Windows Server. There is also the $116/mo offer for a Linux environment that gives 1 GB performance, 20 GB hard disk, and 1 GB RAM. In short, it’s advised that you sit down, calculate exactly what you need and then contact Rackspace when you have a package outline that you think will suit your needs. 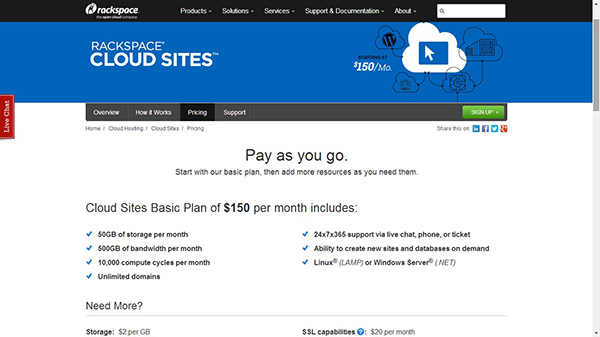 Alternately, you can use the Rackspace calculator to get an idea of what to expect and then buy your hosting plan.